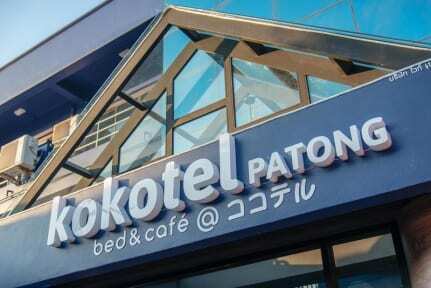 Kokotel is unique and innovate Bed & Cafe concept. Started with a 1st branch in Bangkok in 2016. For all budget but having strong preference guests, we created a creative and comfortable dorm room only here in Patong. We are friends and families serving friends and families, we are ready to welcome and treat you with heartfelt hospitality. At the first floor you can enjoy tasting special Italian-Asian fusion dishes, fresh beverages and drinking alcohols with your mates. At the top floor of the hotel, swimming pool and cool public area is ready to prove your chill and relax time. 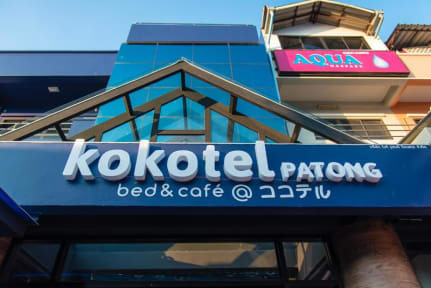 Our staff, facilities, location and price, we provide you the best choice in Patong. Perfect location being right next to the beach and a night market! Staff was super friendly and nice. The buffet bar that comes with the breakfast was more than enough to provide us energy for our day. The tourist booth right outside the door was super helpful and easy to book all our tours. If I ever return to Patong, I will surely stay here again. Definitely would recommend. Best location to the beach, food, and shopping !! The pool is great and staff is very welcoming .... you can be lazy and just stay in Phuket in the short radius of a quarter mile and enjoy everything the town has to offer .... number 1 location to access anything and everything!!! Breakfast is very good! They have umbrellas and beach towels! I couldn't say enough about how wonderful of a hostel this was by far my most favorite place to stay in Bangkok out of seven different hostel. Yin and go we're really really wonderful hosts went way above and beyond to help me. The location was within 3 minutes of the BTS SkyTrain and the MRT so getting around was a snap I got a good tutorial on how to do that from go. All kinds of food vendors downstairs on the street lots of really cool places to go this is the perfect hostel to stay at. Great location, clean, staff were friendly. This is my second stay at this hostel and would definitely choose to go back there. Thanks for the wonderful experience. However if there was one thing that could be changed or re evaluated it would be the visitation policy. We are adults who are coming from out of town and what to have fun. We invited guess to the wonderful pol upstairs but was continuously denied at the front due to a lack of trust in not taking them to our rooms. When you do this, this rule is not for adults, more for kids regardless of the purpose. Visitation should not be a issue. Thanks again! Lovely rooms, pool and outdoor area. The staff were extremely helpful. But it is not a place to meet other people this time of year -it was very quiet in the main lobby. But otherwise,it couldn't be better.